Keeping active & healthy pays off. When my husband Dave retired from GE last summer (although he’s hardly kicking back), we faced a number of important decisions, not the least of which was what to do with his pension. Even with my financial credentials, we decided to call in a specialist to help us weigh the choices and considerations. We turned to Mark Maurer, CFP® and his firm Low Load Insurance Services.As it turned out, all that health and fitness Dave’s been pursuing paid off. 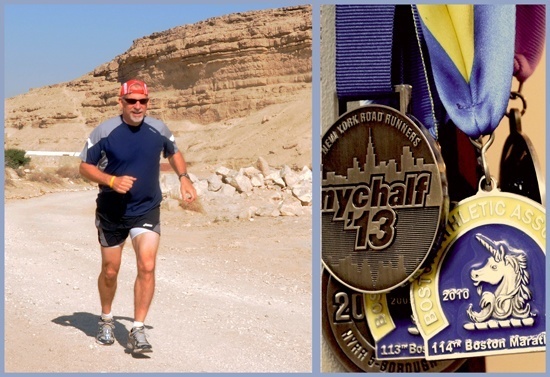 As a 58-year-old runner and cross-fitter, he’s in great shape, which qualified him for Super Preferred rates. When Mark helped us do the math, we determined that instead of taking a survivorship option it would be more advantageous for Dave to take his pension as a Single Life annuity and buy life insurance policies that would take care of me and the boys if he should die before us. In this guest post, Mark offers ideas to help you consider similar pension questions of your own. To learn more, be in touch and we’ll be happy to help you with these types of decisions. By Mark Maurer, CFP®, Low Load Insurance Services, Inc. If you are a baby boomer reaching retirement age, you may be agonizing over your pension distribution choices. In addition, if you are a long-time corporate employee being offered an early-out package, you’ll want to know how to plan. Should you take the larger monthly payout for as long as you live and ignore the possibility that benefits would cease for your surviving spouse? Or are you better off taking a reduced income and guarantee those payments as long as either spouse lives? Consider the case of Happy Retiree and his wife, Susie. Happy will be 62 in December and he’s been offered an early retirement program from his company. Susie is also 62. The Retiree-Life-Only option for Happy has a guaranteed payout of $5,000 per month. The Joint and 100% Survivor monthly benefit is $3,535. Their current budget requires $4,200 per month, so they really liked the idea of the $5,000 monthly benefit. The only life insurance Happy owns is the Term provided by his company, and that ends when his employment ends. If they take the $5,000 payout, Susie would be left without income if Happy dies first. But the $3,535 Joint Survivor option isn’t enough income for both of them and they are relying primarily on their pension for their retirement funds. What could Happy’s advisor recommend to maximize his pension? How much life insurance does Happy need to insure a lifetime income for Susie? How much will that coverage cost? How does that compare with taking the joint life option? 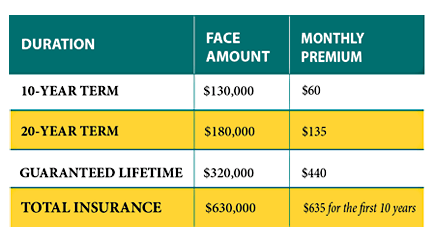 Since the difference between the Life-Only option and the Joint Life option is $1,465 ($5,000 minus $3,535), if life insurance in an amount that meets their needs can be purchased for less than $1,465 per month, then buying life insurance is sound. Next, we looked into Single Premium Immediate Annuity amounts that would be needed today at different ages to guarantee Susie’s income if Happy died. At age 62, Susie would need $630,000 to guarantee an income for life. But as time passes and her life expectancy shortens, that amount decreases. At age 72, she needs $500,000. At age 82, she needs $320,000. How much will this coverage cost? After the 10-year Term policy ends, the monthly premium drops to $575 and after 20 years, the monthly premium drops to $440. Each time their monthly outlay decreases, their spendable income goes up. Layering the coverage with both Term and Permanent insurance matches their decreasing need for coverage with the decreasing monthly costs.This plan would allow Happy and Susie to get the entire $5,000 to live on. Yes, they’d have to pay $635 per month for the first 10 years, but that still gives them a net of $4,365 per month. This is $830 per month more than the alternative available with a Joint Life option. What if Susie dies first? If they’d opted for the Joint Life plan, Happy would still get only $3,535 per month. If he no longer has any reason to use life insurance to maximize his pension, then he can simply stop paying premiums and spend the entire $5,000 monthly amount. The permanent policy may even have some cash surrender values that would return part of the premium he’s already paid or Happy might choose to keep the Permanent policy to leave a legacy for his children or his favorite charity.Consider Health Insurability Issues First! If Happy is healthy, this solution works great. But what if Happy isn’t healthy? How can you find out if this plan might work? The first place to start is with a Preliminary Underwriting review. Pre-retirees who want to know more can ask their advisor to put them in touch with us, so we can offer this review or other personalized Pension Maximization solutions before it’s decision time. An ounce of pre-retiree planning can offer pounds of improved retirement lifestyle. Mark Maurer, CFP® is President of Low Load Insurance Services (LLIS) – The Fee-Only Advisor’s Insurance Advisor. LLIS is not made up of money managers, accountants or financial advisors, nor do they solicit business from the general public. Rather, they are experts in finding the right insurance based upon a client’s needs and their Fee-Only financial advisor’s recommendations.